I wanted to photograph stars this night, but instead haze from Siberian forrest fires were lit by Portland's city lights. It was a cold night. Andy Adkins in the sun's extreme backlight. 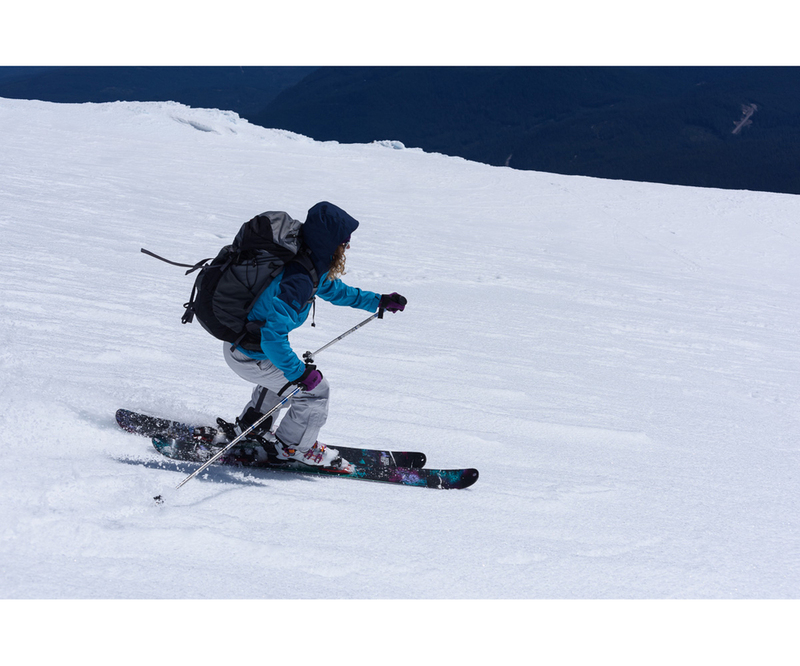 Stacey Guggino puts skins on her skis in preparation for an ascent of Mount Saint Helens. Film-maker extraordinare Andy Adkins readies his split board to climb. Waxing my climbing skins to keep them from absorbing water and balling up with fresh snow. Stacey puts her bindings in climb mode and starts the ascent. Andy takes in the big Alpine evening. We hurry for the summit to catch sunset. The view to the west as we rolled up on the Crater. Cornices are a deadly hazard here. Ultra-hi-rez, ultra-wide panoramic-merger West to the Left; East to the right behind Andy's small figure. The crater rim fills the foregroud while countless ridges stretch to the last light. 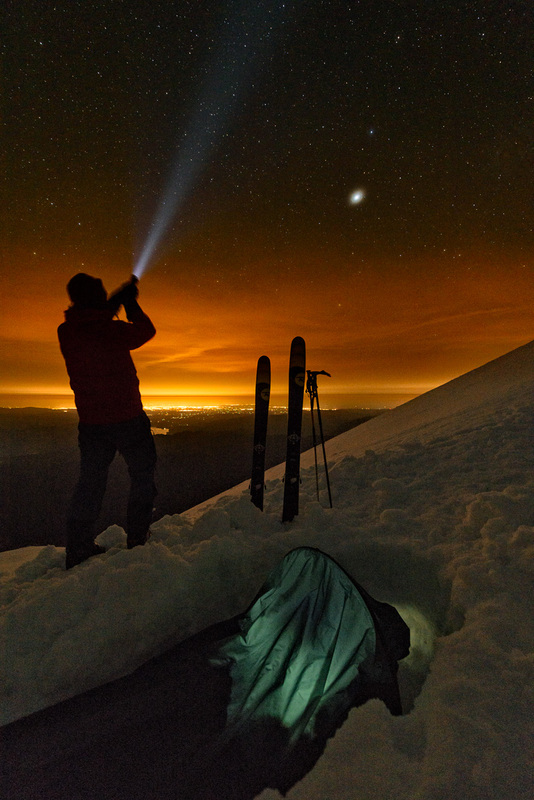 Me looking out at Portland lighting haze from Siberian wildfires from my summit bivy on Mount Saint Helens. Yeah, 2nd copy of this Panoramic. This is my favorite image from the trip and its the first I created this morning. Fumerols rise from the growing dome inside the crater. Spirit Lake is still covered with logs from the massive eruption more than 3 decades ago. Here's Stacey with a sunstar. I love how these look with Alpine skies. Andy Adkins doing his film-making magic in one heck of a spot. 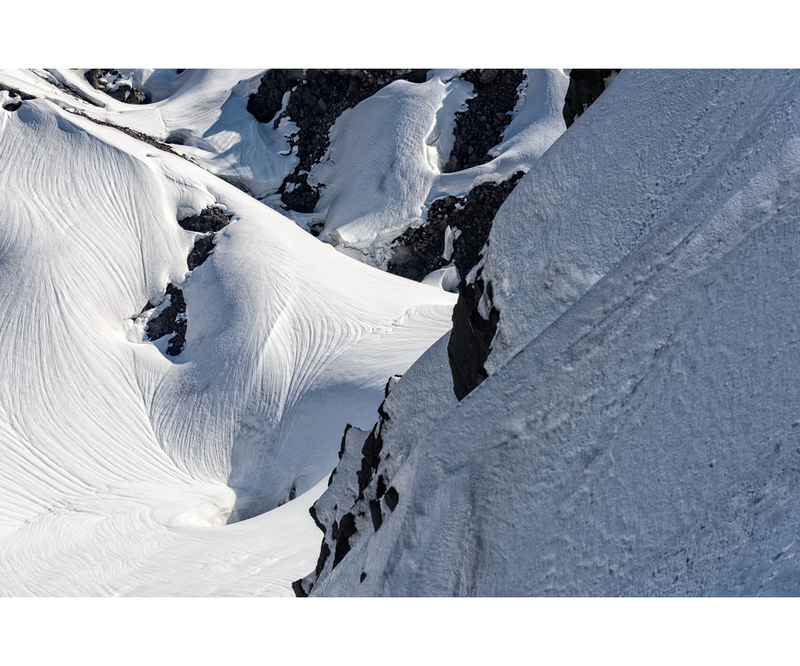 I ljust love the swirly patterns of snow and rock inside the crater. 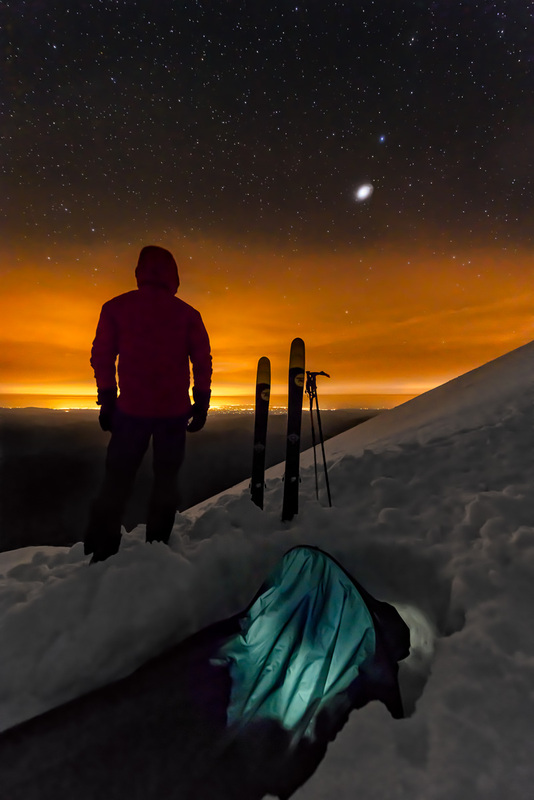 Camped at the crater rim of Mount Saint Helens, Andy Adkins boils water for breakfast as the sun rises behind him. The view from the crater rim out over the dome and Spirit Lake to Mount Rainier. Andy hiking below the edge of the crater gives the scene needed scale. There is nothing like descending on Backcountry Skis. If only there was more snow this year. End of a Great Trip! What a trip! 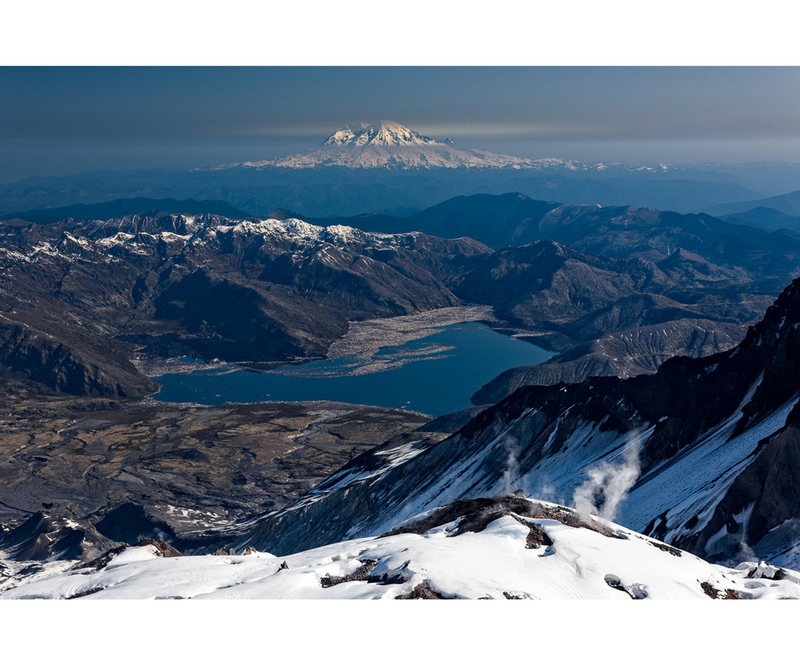 A couple of weeks ago I skied Mount Saint Helens with Stacey and my friend Andy Adkins. Andy and I bivyed overnight at the crater rim. Not only did we create a bunch of great photos and video, but we also had a really fantastic time. 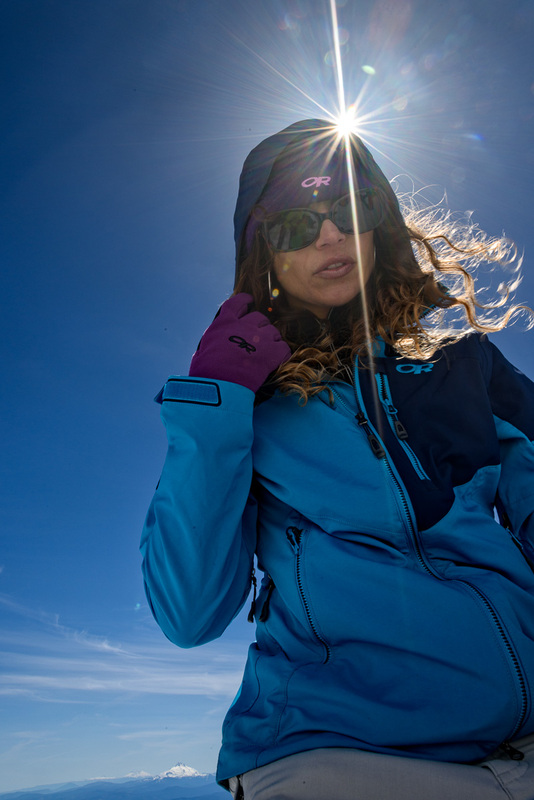 Like any mountain expedition, we had surprises. Knowing there was little snow this year, we were still shocked at how little there was down low. Temperatures at the rim were a lot colder than forecast and haze from Siberian wildfires obscured the Milky Way, but gave us a crazy light-show all it's own. At the top is a 26 image slideshow of the trip. I've briefly captioned each slide to tell the story. Hope you enjoy the adventure. If you haven't already, I hope that you'll sign up for my free newsletter with tales of adventures, prints, workshops, tips, tricks and all things photographic. Cabin fever! The sun was out, it felt like spring in Portland and I was stuck working on my computer. Eventually overwhelmed -- I headed to the river for sunset. Despite a heavier cloud-cover than I'd hoped for, I really liked the way the subtle color in the western sky worked with the Seahawks colors on the Morrison St. Bridge to the north. The water was pretty choppy so I slowed my shutter to 4 seconds to smooth it out and help with the reflections. Yep, that's right... 4-seconds times 30 frames. With long exposure noise reduction turned on that means it took over 4 minutes to expose this image. Following my current workflow: I did RAW edits in Adobe's Lightroom 5, assembled the panoramic in Photoshop CC and performed my finishing edits in onOne's Perfect Photo Suite 9. On this cold morning I wanted to convey how amazingly Seattle is nestled between the water and the mountains. A long lens is the best way to compress space and pull things optically closer together in the frame, but how do you capture a wide scene with a big lens? PANORAMIC MERGER is the answer... I used my 70-20mm and Really Right Stuff Panoramic adaptor to get just what I wanted. Seattle is such a fun city. The city itself the Sound, the Cascades, the islands, Olympic National Park. It's the jumping off point for so many of my favorite remembered adventures. If you haven't been here, put it on the list. Technical Details: D800, Nikkor 50mm, Ultra-high Resolution Panoramic Merger each file at F6.3 for 4 seconds at ISO 100. Staring out from the bluffs northwest of the bridge, I recognized that this view speaks to me of a graceful connection between the West's wide-open spaces and this city. Everything in the scene is big: the city, the surrounding hills, the bay, the ocean, the sky and the bridge that connects them all together. To capture this feeling, I decided to create some really huge images. Multiple frame panoramic pictures are my preferred way of going really big. Merging a series of images not only lets me fit more of the scene into a photograph; it also allows me to do it with less distortion and far more resolution. In other words it gives me really big beautiful prints. Technical Details: Nikon D800, Nikkor 28mm, Ultra-High Resolution Panoramic, Each Image at F2.8 for 1/20 sec at ISO 100. Utilizing a sturdy tripod and panoramic adaptor, I setup my 36.3 megapixel D800 and waited for some color in the evening sky. As if on que, nature provided a stunning sunset just as a large ship sailed under the bridge. Using careful manual exposure metering to take advantage of my Nikon's extremely wide dynamic range (or ability to capture bright highlights and darks shadows simultaneously), I triggered a series of eight wide angle images from the bright western sky over the headlands all the way past 180 degrees to the dark eastern sky over the distant Bay Bridge. The resultant image, best captures that artistic connection between the natural and the urban that this bridge provides. After the sunset, while the sky was still a lovely shade of blue, the Golden Gate and San Francisco erupted in light. Swapping my wide-angle lens for a normal focal length, I pivoted my camera through two rows of 10 images to create the 300-megapixel image headlining this story. The ability to enlarge this image is difficult to illustrate on a computer screen. Suffice it to say, that the smaller square crop the image, displayed to the right is still scaled down to one fourth it's original size. I can't wait to print these images BIG!